I started Keto not too long ago. One of my favorite things pre-Keto was macaroni and cheese. Seriously, mac & cheese gave me life. With Keto came changes and one of the main ones was no more pasta (carbs!). I’ve really struggled with this and so have my kids. 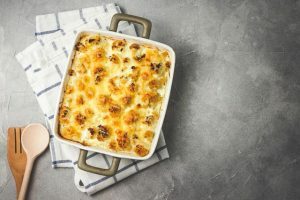 A friend shared this recipe with me the other day and said it would make a great substitute for my beloved mac & cheese. I was skeptical at first, but she was right! Instead of pasta noodles this take on the traditional recipe uses cauliflower. Oh, and as an added bonus this one has lots of bacon! It is recommended that you cook the cauliflower for a little while before make the rest. If not, it is going to take longer they you want. While I admit I was skeptical at first, I am very glad I tried this recipe out. My husband and kids actually enjoyed it as well and they have all requested I make it at least once a week. This is definitely going into my stash of “go-to” recipes and hopefully it will be one that will go in yours, too. 2 sm heads cauliflower-they need to be cut into florets. 1 1/2 cups shredded cheddar (I shredded my own because the carbs are higher in the pre-packaged shredded cheese. Black pepper; we grind ours but it isn’t required. 6 slices of bacon; make sure they are cooked to your liking and then crumbled. 2. Take a large pot and bring some water to boil. Add salt and blanch the cauliflower. 3-4 minutes in how long I did it. . Drain and squeeze the cauliflower to get all of the water out. 3. To make the cheese sauce, melt butter in a medium to large skillet. Add the garlic and cook for about 1 minute. Add the almond flour and stir until golden brown; roughly 1.5 -2 minutes. Add almond milk, bring to a low simmer. Add the softened cream cheese and whisk until t is all combined. 4. Remove from heat. Stir in 1 cup of cheddar cheese (until melted). Season with pepper and salt-optional. 5. Put the drained cauliflower in a 9”-x-13” dish. Pour in the cheese sauce and stir until all is combined. Put aside 1 tablespoon each of the cooked bacon and green onions. Pour the rest in and stir until everything is combined. Add the remaining tablespoons of bacon, green onions, and cheese. 6. Place in the oven for approximately 30 mins or until cauliflower is tender and the cheese is melted. I started Keto not too long ago. One of my favorite things pre-Keto was macaroni and cheese. Seriously, mac & cheese gave me life. With Keto came changes and one of the main ones was no more pasta (carbs!). I’ve really struggled with this and so have my kids. 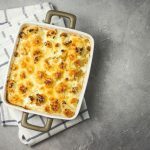 A friend shared this recipe with me the other day and said it would make a great substitute for my beloved mac & cheese. I was skeptical at first, but she was right! Instead of pasta noodles this take on the traditional recipe uses cauliflower. Oh, and as an added bonus this one has lots of bacon! It is recommended that you cook the cauliflower for a little while before make the rest. If not, it is going to take longer they you want. While I admit I was skeptical at first, I am very glad I tried this recipe out. My husband and kids actually enjoyed it as well and they have all requested I make it at least once a week. This is definitely going into my stash of “go-to” recipes and hopefully it will be one that will go in yours, too. Take a large pot and bring some water to boil. Add salt and blanch the cauliflower. 3-4 minutes in how long I did it. . Drain and squeeze the cauliflower to get all of the water out. To make the cheese sauce, melt butter in a medium to large skillet. Add the garlic and cook for about 1 minute. Add the almond flour and stir until golden brown; roughly 1.5 -2 minutes. Add almond milk, bring to a low simmer. Add the softened cream cheese and whisk until t is all combined. 4. Remove from heat. Stir in 1 cup of cheddar cheese (until melted). Season with pepper and salt-optional. Put the drained cauliflower in a 9”-x-13” dish. Pour in the cheese sauce and stir until all is combined. Put aside 1 tablespoon each of the cooked bacon and green onions. Pour the rest in and stir until everything is combined. Add the remaining tablespoons of bacon, green onions, and cheese. Place in the oven for approximately 30 mins or until cauliflower is tender and the cheese is melted.